Every Star Wars fan understands the importance of a hologram – those messages could mean life or death in a galaxy far, far away. For years, optical engineers have been trying to create freestanding holograms – three-dimensional images created with lasers – and have achieved some success, like the virtual image of Tupac Shakur at Coachella 2012 or, more recently, the hologram of French presidential candidate Jean-Luc Melenchon. But these aren’t true holograms, they’re near approximations. To create perfect holograms, a medium of certain thickness needs to be modified in such a way that different sections reflect light in different phases. That thickness has usually been around a few millimeters at the minimum. A team of Australian and Chinese scientists, however, have created the ‘world’s thinnest hologram’ on a medium that’s 1,000 times thinner than a human hair. Led by RMIT University's Distinguished Professor Min Gu, the team used a 25-nanometer-thick material called a topological thin film insulator and carefully controlled lasers to encode a holographic image that can be viewed without the aid of 3D goggles. The technology is apparently simple and, thanks to its nano-scale size, could well be integrated into consumer electronics like smartphones, tablets and television sets, ushering in a new age of three-dimensional entertainment and communication. "Conventional computer-generated holograms are too big for electronic devices but our ultrathin hologram overcomes those size barriers," Professor Gu explained. "Our nano-hologram is also fabricated using a simple and fast direct laser writing system, which makes our design suitable for large-scale uses and mass manufacture." It’s needs to be noted that the prototype created by the team doesn't produce freestanding holograms. Instead, the technology manipulates light like any standard flat hologram, but produces phase shift at much higher resolutions for more detailed images that appear to pop off the surface. 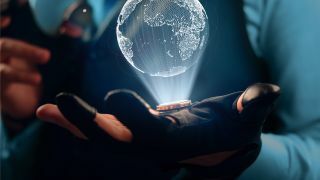 Citing examples for uses for this technology, Professor Gu added, "Integrating holography into everyday electronics would make screen size irrelevant – a pop-up 3D hologram can display a wealth of data that doesn't neatly fit on a phone or watch. From medical diagnostics to education, data storage, defence and cyber security, 3D holography has the potential to transform a range of industries and this research brings that revolution one critical step closer." Until holographic smartphones become reality, Microsoft has already ushered in the future of computing with its augmented reality viewer. Read our hands-on review of the HoloLens.